If you want, you can lightly fry the hazelnuts in a dry frying pan on low heat for max 2 minutes. Roasting will give the hazelnuts a brighter nutty taste and aroma. 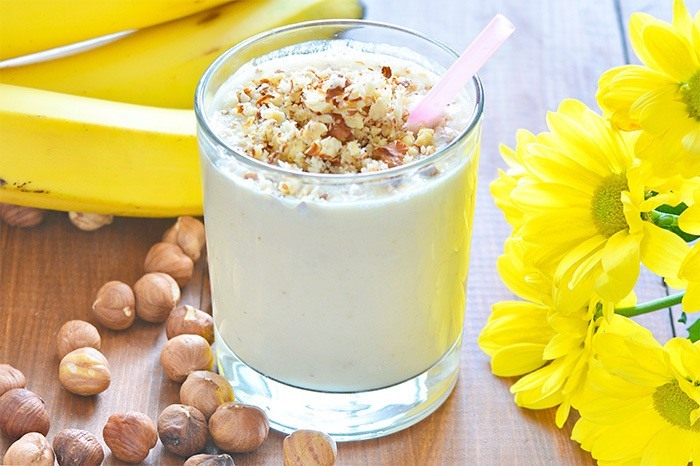 Pour the yogurt and banana into the blender. Process for 1 minute. Pour the yogurt-banana blend into a glass, and rinse the blender bowl and wipe it dry with a clean towel or napkin. Pour the hazelnuts into the blender and grind them for 10 to 20 seconds until they are crushed into medium-sized crumbs. Sprinkle the smoothies with the hazelnut crumbs. Serve the ready smoothies to the table. Bon appetit!